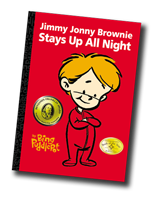 Jonathan is Bing Puddlepot, the author of “Jimmy Jonny Brownie Stays Up All Night,” a book about a boy, bedtimes and natural consequences. 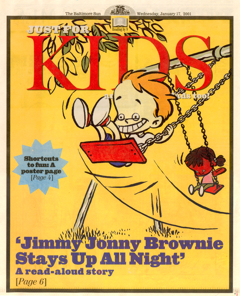 In the picture book illustrated by Sherwin Schwartzrock, Jimmy Jonny finally gets what he’s wished for “his whole life” — a chance to skip bedtime altogether. With imaginative adventures throughout the night and amusing repercussions the next day, this picture book helps children figure out bedtimes on their own. You can find more about this book at Puddlepot.com. This book was honored as the Foreword Magazine Book-Of-The-Year Finalist (their highest honor), as received a silver Benjamin Franklin Award by the Independent Book Publishers Association. One of the benefits of being in two writing groups is that you do a lot of writing. I have over two-dozen picture book manuscripts and a middle grade novel, as well as another middle grade novel in progress. “The Contraption of Elsewhen” is about a 10-year-old girl who has a strange ability to find things. The skill leads her to a flying machine that’s hiding on the edge of her small town. She quickly realizes she’s not just meant to find the airship but where the airship needs to return, 150 years after it was left behind.